My 12-minute walk west to Donegall Square from the Central Railway Station in Belfast surrendered no indication that not that long ago, this was a bit of a factious war zone, with terrorist bombings willfully ripping apart lives and neighborhoods. Now it seemed as peaceful as the rest of Ireland, and I was thrilled to be in this former no-go zone. 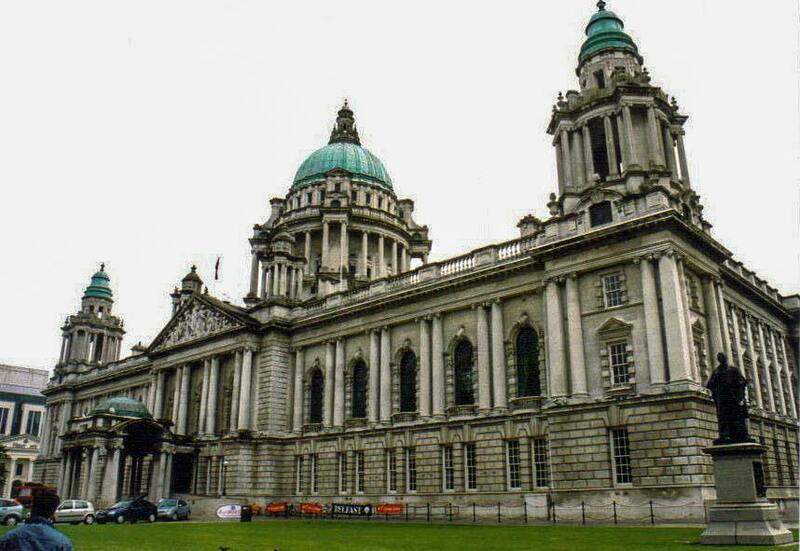 Belfast’s City Hall lies at the heart of historic Donegall Square. Named for the Chichester family, who have held the titles of both marquess and baron of Donegall since the 1500s, Donegall Square is a hub of activity, with pedestrians heading down the main shopping street of Donegall Place, bankers conducting business in the dozen different headquarters and branches around the square, and countless buses shuttling citizens and visitors around “Old Smoke,” Belfast’s Victorian nickname when it emerged as the leading industrial city in all of Ireland. Anchoring it all is the gorgeous City Hall. Completed in 1906, this Baroque Revival beauty constructed from white-gray Portland stone (bathed in green light on St. Patrick’s Day) was the first structure to capture my attention, with its central copper dome turned verdigris, corner towers, columns and balustrades, porte cochère, and ornate pediment crowded with sculpture at the main central entrance. I couldn’t resist stepping inside and then, immediately awed by the lush interior, joining a tour of the building, during which the lord mayor of Belfast, donning the rather clunky 14-lb. Lord Mayor’s chain and medallion, crossed our path and stopped to greet us and welcome us. Fit for a queen: The Robinson & Cleaver Building was a favorite shopping destination for Victoria, whose statue faces it today. Surrounding City Hall and open to the public, a green space makes for a fine setting to relax and admire the statues, memorials, and monuments scattered around. Front and center, Queen Victoria, holding her scepter and orb, stands on a plinth surrounded by figures including those representing Belfast’s chief industries at the turn of the 20th century, weaving and shipbuilding. That second industry gave birth to more than 200 ships, including the Oceanic, Olympic, and most famously, Titanic, built in Belfast Harbor in 1912. A memorial to the luxury liner’s victims who died on April 15, 1912, serves as a reminder of both those who drowned in the frigid North Atlantic and of man’s arrogance (Unsinkable? Not.) Other notable memorials include those to the only Northern Irish recipient of the Victoria Cross during World War II, the former head of the Harland and Wolff shipyard, and Irish troops killed during a battle in Korea in 1951. Northern Ireland’s main war memorial, with a Garden of Remembrance and cenotaph, occupies a good stretch of grounds along one side of City Hall. I took a seat on one of the inviting benches around City Hall to admire all the other impressive buildings encircling Donegall Square. 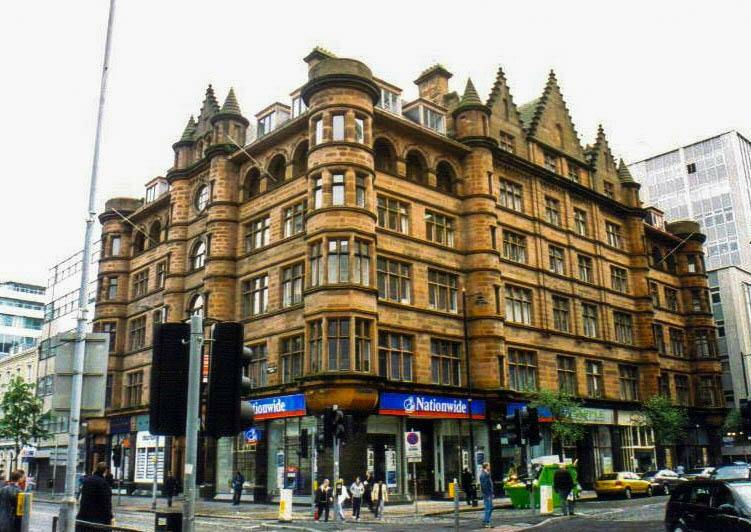 The Scottish Mutual Building, originally called the Scottish Temperance Building, is a massive pile of dark red sandstone completed in 1904. The baronial building, with its turrets and crow-stepped gables, is now slated to be converted to a luxury hotel. The Scottish Mutual Building adds a splash of color to the square. Long before e-tailers tolled the death of brick-and-mortar stores, the Robinson & Cleaver Department Store, opened in 1885, drew an exceedingly well-to-do customer base. The gorgeous six-story building, constructed with Scrabo stone that resembles gray granite, runs 77 feet down Donegall Place and 128 feet along Donegall Square. Three octagonal turrets topped with verdigris ogee domes frame the rooftop balustrades. The two clocks at the base of the corner turret measure six feet across. Busts on the façade present a rather diverse cross-section of people from Greenland to India and include three of Robinson & Cleaver’s clients, Queen Victoria, the maharajah of Cooch Behar, and the German kaiser. Across the street, a red sandstone Venetian palace, built as a linen warehouse in 1869, won praise from Oscar Wilde, who described it as “beautiful.” Elsewhere around the square, I was delighted by the appropriate sculpted swag of fabric over the entrance to the Linen Hall Library, the oldest library in Belfast, and by the floral lintels above the windows and the carved portholes with reliefs of George Washington, Isaac Newton, William Shakespeare, and Michelangelo, among others, along the ground floor of the low-rise Yorkshire House (1862), originally a Victorian linen warehouse and now the Ten Square Hotel. 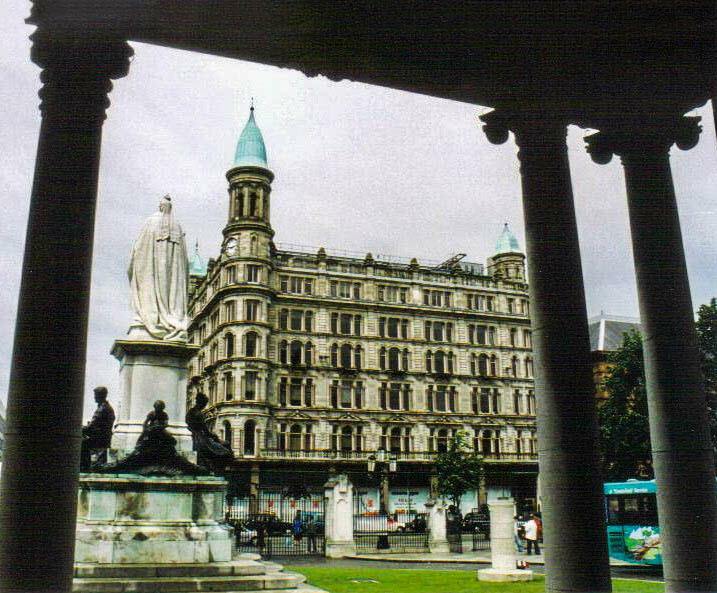 The columned classical portico is all that remains of the old Donegall Square Methodist Church, replaced by the blah Ulster Bank. Its neighbors include the vaguely art deco Imperial House and the grand Ocean House, a red, Scottish baronial Tudor from 1902 with sculptures of mermaids holding shields and an angled front door that could easily pass for the main egress of a castle. 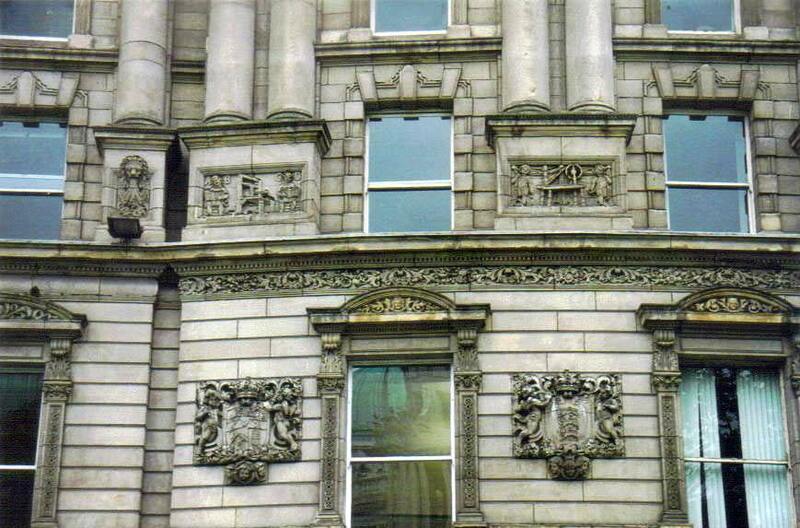 Architectural details on the Scottish Provident Building both embellish and educate. The most impressive, to me, was the Scottish Provident Building, now an exclusive office business center. Built in 1902 as an imposing, powerful assertion of commercial authority, the sandstone building is all about the details. Two octagonal pavilions at the corner are topped with verdigris domes. The central section of the façade bows out slightly from the Palladian frontage as is capped with a pediment featuring a detailed crest and copper dolphins and sphinxes. Four panels at the best of four pairs of Corinthian columns are engraved with carvings representing the city’s main industries at the start of the 1900s: printing, ropemaking, shipbuilding, and spinning. I also found carved heads of lions and queens, and of those standing in for Canada, England, India, Ireland, Scotland, and Sudan. Not as congested as Dublin but still with plenty to see, Belfast turned out to be one of my favorite cities on the island of Ireland, and Donegall Square is the perfect place to start exploring this urban area of surprises and delights.